Kannastör sets the standard for quality herbal grinders at an affordable price. Concentrating only on aluminum grinders in either 2-piece grinders or 4-piece pollenators. You will not find a more reliable grinder that stays sharp longer, period. Its only competitor for quality are the SweetLeaf grinders, which we also offer here at the shop. Both, though, are top choices for offering years of reliable grinds, and each person has their own personal preference when it comes to either brand. 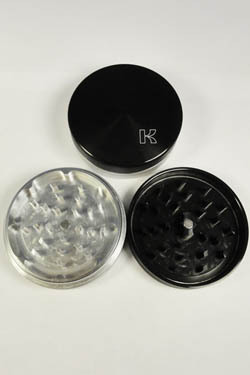 All of our Kannastor herbal grinders and pollenators come in brushed aluminum with a anodized black top, as pictured.